I've mentioned Worldfoods before - that I've been selected to become a member of their Taste Team and will be trying out some Asian recipes and posting the results here for you all to see. I've also shown you my kitchen and there will be a new challenge each week. 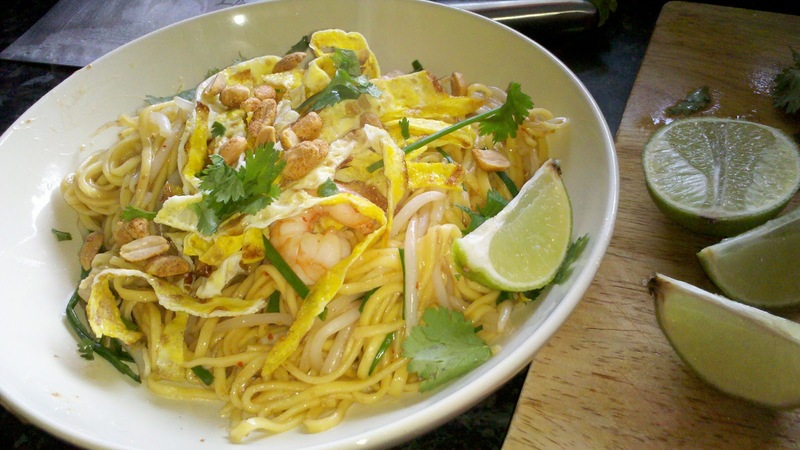 So here is the first cooking challenge: Pad Thai. Pad Thai literally means a "stir fried noodle dish" and Worldfoods have a sauce that you just add to a hot pan, swish around with some prawns, beansprouts and chives and then toss about with some cooked noodles. The whole thing took about 10 minutes to make (including faffing about finding and opening packets) which is great and certainly helps resist the urge to phone a takeaway because it is actually quicker! The sauce itself wasn't as spicy as I thought it would be, and it really did taste fresh. I've bought bottles of Pad Thai sauces before at the supermarket and somehow they all had a 'plasticky' taste to them. But not this one. And as I mentioned although it's dotted with little red flecks of chilli, the flavour is more aromatic rather than actually spicy. So my two-year old quickly passed up her ham sandwich (I couldn't blame her) and helped me polish off the noodles. I also loved how the sauce didn't claim to be the whole deal but the recipe on the side of the bottle suggested sprinkling over some coriander leaves, squeezing over some lime juice and topping with crunchy roasted peanuts and sliced omelette. All this adds so much to the flavour and texture of the finished dish - the sauce just gives you the base for that authentic Pad Thai taste. I think that's where the supermarket bottles I'd had before went wrong: they tried to flavour the sauce with peanuts and coriander when it's right that it should be a finishing touch using the natural ingredients. And it also looks great if you want to show off a little bit! The only problem with it is that one bottle feeds two people - so if you want to feed a family with it, you'd have to buy 2 or 3 bottles - but hey, that's not so hard, really is it? I really enjoyed this dish. Keep a lookout for more WorldFoods Fusion of Flavours posts as we're given more challenges in the weeks to come. Your blog is well-written, it looks good, and for some odd reason, it makes me REALLY HUNGRY! ha ha thank you :) Just doing my job... !